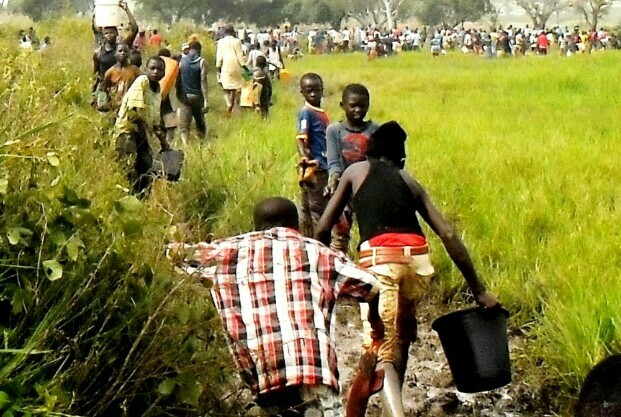 Hundreds of locals at Rido village, the immediate host community of Kaduna Refinery and Petrochemical Company (KRPC) in Chikun Local Government Area of Kaduna State on Thursday bombarded a spot where one of the KRPC pipe bursted to scoop fuel. Eyewitnesses account at the scene of the incident said they discovered that petroleum product suspected to be premium motor Spirit (PMS) was gushing out in high volume at about 07:hours Thursday which eventually attracted all age groups from the community without necessarily remembering experiences from same attitude in other parts of the country that left several dead. “We just discovered this morning that fuel is coming out on its own and instead of just allowing it to waste we decided to help ourselves. But you know there is serious hardship in the land now so everybody whether old or young is trying to see what they can make out from here. “As you can it is refined fuel because we are already looking for buyers immediately. Whether fire or no fire, nobody is thinking about that now everybody is trying as much as he can to get enough free fuel before the police come because we know they will come and drive us away. “As I speak to you, nobody from KRPC is aware of this. Besides, we have been complaining long before now but they turned deaf ears because they thought we are disturbing them. Look how much is wasting here. “Actually, we don’t know what caused the burst but it may be whether weak pipe or pressure considering the volume at which the thing is gushing out since morning. This is the first time this is happening in this axis in recent times. Already, all the crops in the affected area are gone. For how long do we continue to suffer in our own community?, one of the locals said. Efforts to speak with top management staff of KRPC for comment were unsuccessful but the outgoing Manager Corporate Department, Idris Abdullahi said he was not aware of the development as at the time of filing this report.